We're Long Beach, CA's premier Dog Boarding facility providing pampered services a family pet deserves. Our dog boarding guests enjoy indoor & outdoor playtime and supervision by our experienced and caring staff. Our unique Dog Daycare program here in Long Beach provides your dog with the right amount of stimulating activity, socialization and rest to ensure that your dog will thrive. Call us for more information. 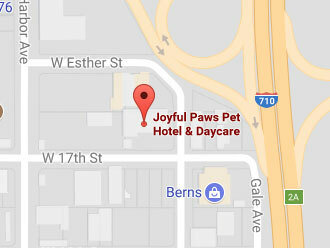 We love cat's too and Joyful Paws Hotel is your cat's home away from home! Our kitty condos cat boarding facility provides all the comforts of home in a safe, quiet, and private space. 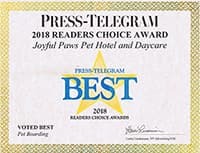 Joyful Paws Pet Hotel & Daycare is peace-of-mind pet care for dogs and cats in lovely Long Beach, CA. We offer hotel style Dog Boarding, Cat Boarding, Dog Daycare and Dog Bathing in our 12,000 square foot facility offers all the fun and amenities you could ask for and is conveniently located right off the 710 freeway. We're convenient to the entire Long Beach area including Lakewood and San Pedro. Copypright © 2019 Joyful Paws Hotel. All Rights Reserved.